Humans and elephants have other bonds, Elephants suffer from indigestion, respiratory problems and even have colds like human beings. Zoo elephants have died from herpes and been cured with anti-vital medicines that have cured humans. Wild elephants have also died of elephant herpes. Tetanus is an often fatal disease for elephants. If an elephant comes chasing after you the best thing to do is run behind a tree or solid, stationary object. If there are trees or solid, stationary objects around...I don't know, run like hell. Scientists can identify individual elephants by the different shapes of their ears and other makings.They sometimes track elephant from sound of stomach. Book: Gone Astray by Richard Lair is regarded as the definitive book on domestic Asian elephants. Lair is known as “Professor Elephant.” He trained elephants for the Disney film, Operation Dumbo Drop. Ganesh Ganesh is the Hindu elephant-headed god of prosperity, wisdom, success, intelligence and good luck. Very popular, particularly in Bombay and southern and western India, he is known as the creator and remover of obstacles, bestower of happiness and the eliminator of sorrow. Hindus pray and make offerings to him before beginning a journey, buying a house, starting a performance or launching a business venture. Even other gods pay tribute to him before they engage in any kind of activity so he can remove obstacles. Ganesh is the son of Shiva and Parvati. Believed to have evolved from a fertility god, he is often depicted with a huge pot belly, slightly dwarfish, sitting like a Buddha or riding on a five -headed cobra or a rat. He has two or four arms. In one hand he carries rice balls, or sweetmeats (he is fond of eating and especially loves sweets). In another he holds broken pieces of his tusks, with which it said he inscribed the Mahabharata as the sages dictated it to him. Sometimes his trunk rests in a bowl that he hold in one of his hands. Sometimes he carries a trident to indicate his link to Shiva. Other times he carries a noose or an elephant goad. Ganesh’s association with rats comes from the ability of rats to gnaw through anything and remove obstacles. 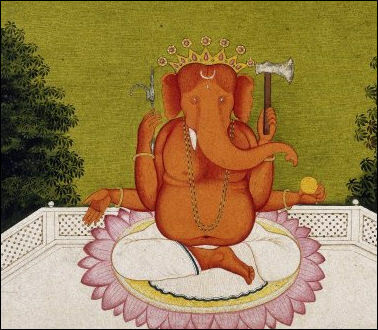 The are several stories explaining how Ganesh obtained his elephant head. According to one he attempted to block Shiva from entering a room where Parvati was bathing. Shiva was angered by this and chopped off Ganesh’s human head. After Parvati made a fuss, Shiva replaced the head with the head of the next animal he saw, which happened to be an elephant. A popular Ganesh story that Indian parents like to tell their children goes: Ganesh and his brother were challenged to a foot race three times around the world by their mother. Ganesh’s brother took off around the world with lightning speed but Ganesh won by simply circling his parents three times, saying "you are my world." 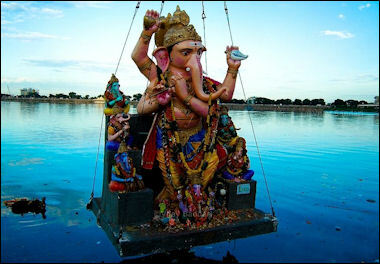 In September 1995, there were reports of Ganesh drinking milk in Calcutta and Jersey City within hours of each other. Not long after that there reports of Virgin Mary statutes drinking milk in Cheshire, England and Kuala Lumpur. Elephants have been "caught, broken, trained and put to work” in Asia for more than 4,000 years. The first elephant species to be tamed was the Asian Elephant, for use in agriculture. The oldest evidence of elephant taming - not full domestication, as they were still captured in the wild---comes from the Indus Valley Civilization, around roughly 4500 B.C. There is suggestion that elephants were tamed in ancient Egypt 5,500 years ago. Elephants buried in elaborate tombs, dated to 3500 B.C., were found in cemetery in Hierakonpolisin ancient Egypt. One of the elephant was ten to eleven years old. That is the age when young males are expelled from the herd. Young and inexperienced, they can be captured and trained at that age. The number of elephants living in captivity is thought to have been around 130,000 during the era of the Mogul kings in 16th and 17th century. From the 16th to the 19th centuries elephants were used in logging, war and religious ceremonies and were traded throughout Asia by Britain’s East India Company. According to a famous fable, three blind men came upon an elephant and couldn't figure out what it was. The first man felt an elephant's leg and thought it was a tree; the second garbs its tail and thought it was rope; and third touched the trunk and thought it was a snake. Among those that avidly hunted African elephants were Theodore Roosevelt and Ernest Hemingway. Roosevelt once killed four elephants in less than five minutes while on safari in British East Africa. You can see two animals in the Hall of African Mammals at the American Museum of Natural History in Washington D.C. Elephants served as armor in ancient battles in Asia. Some regard them as the prototype of tanks. To the sound of drums, warrior with spears advanced on the backs of the elephants while soldiers with swords guarded the animals legs. War elephants sometimes wore heavy armor. They could be force in fighting and take out large numbers of enemy troops by simply crushing them under their feet but they also could become unmanageable if wounded. In Asia large numbers of men were carried, with the senior commander either utilising the howdah or leading from his seat on the elephant's neck. The driver, called a mahout, was responsible for controlling the animal. In many armies, the mahout also carried a chisel-blade and a hammer to cut through the spinal cord and kill the animal if the elephant went berserk. The last great battle of Alexander's campaign took place at Jhelum on the Indus River (110 kilometers southeast of present-day Islamabad, Pakistan) against King Porus, a massive leader who it is said to have stood nearly seven feet tall and presided over a kingdom that covered much of the Punjab in present-day India and Pakistan. In the spring of 326 B.C., Alexander's army engaged King Porus' force of 35,000 infantrymen, 10,000 cavalry and 200 battle-trained elephants. Curtius wrote, “Porus himself rode an elephant which towered above the other beasts. His armor, with its gold and silver inlay, lent distinction to his unusually large physique." The two forces were opposite each other on different sides of the river and Alexander lead his attack in the night during a thunderstorm so the Indian army wouldn't hear or see him coming. Alexander then concealed part of his cavalry and released the remainder of his army in an attack. Porus committed most army to the Alexander's charging force and left himself vulnerable to an attack from the concealed cavalry. In the battle the elephants "kept colliding with friends and foes alike," according to Arrian. And after several hours the Indians retreated in wild confusion and Porus was captured. Alexander admired Porus's courage and let him keep his kingdom on the condition he remained loyal to Alexander. Alexander the Great was said to have been rescued from certain death from a charging elephant by a greyhound. From his base in Spain Hannibal led a force of mercenaries with elephants through the south of Gaul (France) and across the Alps in the winter of 218 B.C. This marked the beginning of the Second Punic War. The elephants had little impact on the fight but they scored a psychological blow for the Carthaginians giving them an aura of power and invincibility. In the Second Punic War, 218-201 B.C., Carthage was anxious to get revenge after the first Punic War. But in the end Rome supplanted Carthage as the predominate power in the Mediterranean. The war was a major milestone in evolution of Rome from a republic into an imperial power. 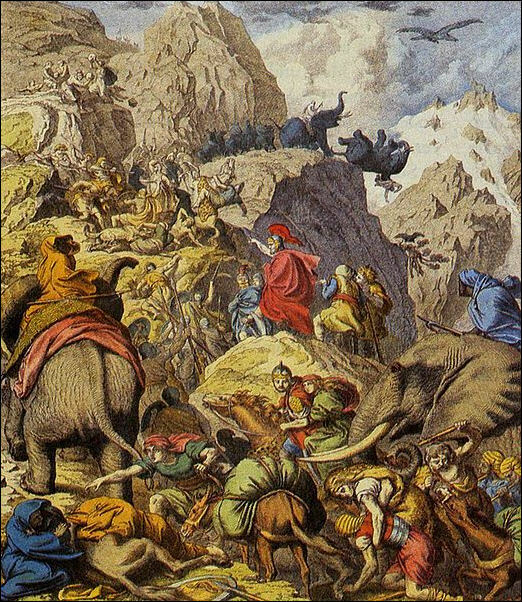 Hannibal led 59,000 troops and 27 elephants across the Alps. His army crossed the bridge-less Rhone and likely endured snow storms and snow drifts when it crossed the Alps. In some accounts all but one of the elephants and half of Hannibal's soldiers were killed in the Alps. No one is sure what route Hannibal took. Much of what has been written about the elephants and Alps is speculation. On the subject of Hannibal's route, Mark Twain once wrote: "The researches of many antiquarians have already thrown much darkness on the subject, and it is probable, if they continue, that we shall soon know nothing at all." Much of the imagery of Hannibal and his elephants comes from Flaubert’s Salammbo . Elephants were native to North Africa in Phoenician times. There were elephant farms to produce animals for work and ivory for craftsman. 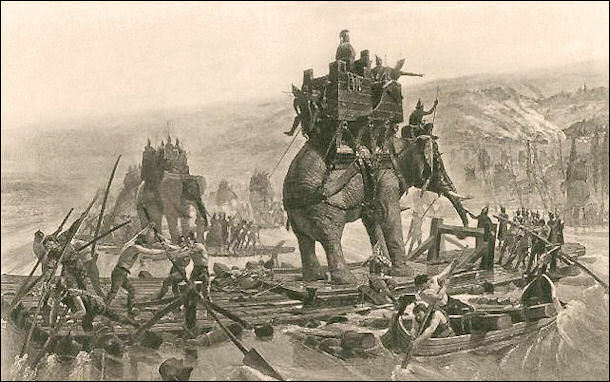 Elephants were introduced into warfare after Alexander the Great and his men encountered them in India. They were part of Carthage’s armies from the third century B.C. onwards. African elephants were used by Hannibal of Carthage. It had long been thought that Asian but north African elephants could be tamed. Experiments in Zimbabwe, South Africa and Botswana have showed that African elephants can be tamed. The tame elephants are trained when they are young. They are orphans whose mother was skilled by poachers. They are often very attached t their human caretakers. Park rangers in Zimbabwe ride elephants on anti-poaching patrols. They have plans to use the animals to plow rocky, hard fields that other animals can't tackle. Among the Thais and other peoples of Southeast Asia, white elephants are regarded as symbols of power and fertility. According to Buddhist lore the Buddha’s mother Queen Mahamaya dreamed of white baby elephant at the conception of Lord Buddha. The discovery of white elephants in the wild is a major event that causes a big stir in the countries of Southeast Asia. This is stark contrast to the West where the expression “white elephant” describes an expensive but useless thing. White elephants are regarded as the most auspicious of all animals in Laos, Thailand, Burma and Cambodia as far back as anyone can remember. They have been sought after and the object of envy. Kings added possession of them to their titles. Great empires have gone to war over them. The royal "white elephants" in Thailand are in fact are pinkish brown or with some whitish markings. They are often difficult to distinguish from normal elephants. Only one looks genuinely pale. The others look like normal elephants. Their proper name is chang samkan, meaning “important” or “significant” elephant. Most are not albinos, which are usually whitish beige. In 2004, a beige-colored albino elephant was discovered in Yala National Park in Sri Lanka. It was a female believed to be around 11 years old. It is extremely rare to find such an animal. There have been reported sightings of such elephants in Thailand and other places put this marked the first time ever that an the existence of a true albino elephant had been confirmed. Thailand had 11 “white” elephants in the early 2000s. Symbols of the monarch’s power, all belonged to King Bhumibol Adulyadej. The person with the most white elephants is considered the most powerful person in Thailand. The elephants existence and good health ensure prosperity for the Thai kingdom. They are regarded as the earthly manifestation of Erawan, the many-headed celestial elephant of the god Indra. Only one royal elephant lives behind the royal moat in the royal palace in Bangkok. Others live at other facilities elsewhere in Thailand. Some royal elephants are kept at the elephant center in Lambang, where four attendants are assigned to each anima and the animals spend their day munching on leaves of replanted teak trees, are hand fed sugar cane and tamarind and have a reservoir where they can take their daily baths. At night they sleep in the their individual sleeping pavilions. What exactly defines a white elephant is the subject of large body of literature. They are not white or albino. They are rare, light-toned animals that must have a particular set of characteristics to be labeled as white. The criteria to define a white in elephant in Thailand is secret and takes experts weeks to sort out. The basic requirements for a white elephant are that it must have some “white” skin (pink splotches on the skin), white eyes, a white upper palate, white nails, white fur, white tail hair and a white scrotum. In Thailand white elephants are supposed to be treated with the same respect accord royal children. By law every white elephant born in Thailand must be presented to the king. Prospective candidates are chosen not only on the basis of pink skin splotches but also on the shape of their trunk and tail, the quality of their vocalizations and even the smell of their dropping. The royal families in Myanmar, Laos and Cambodia used to keep white elephants but the custom has largely died out there along with the power of the royal families. "To an inexperienced man they may look like normal elephants," the overseer of ceremonies at the Royal Palace in Bangkok told National Geographic. "But I have studied them all my life to be able to tell you about their special qualities: a certain shape to their ankles and tail. A whiteness of the eyes, the hair tops, the white skin between folds, and the nails. The greatest of all elephants has two extra toe nails. He is of the same rank as a prince." The name of this cherished elephant has a name four lines long, proclaiming him to be a lotus-colored gift. A jealous Burmese rulers declared war against Siam when a Thai king refused a request to give the Burmese ruler two of his seven white elephants. In the 17th century, a Dutch chronicler. Described a Thai monarch who staged an elaborate cremation ceremony for the elephant and ordered the execution of any keeper responsible for the death of a baby white elephant. In the old days the elephants used to walk down the streets of Bangkok every morning on their way to the river for a bath. The only time this routine was changed, according to an old National Geographic article, was during rutting season when male and female elephants were separated. Bangkok's trolley drivers didn't like this because the male elephants often mistook trolleys for female elephants, often taking off after the trolleys and making a big racket and fuss as they did so. Most trolley drivers were skilled and experienced enough to outrun the run the elephants. In the early 2000s, plans were announced to clone the famous white elephant that belonged to King Rama III, who ruled from 1824 to 1851. The experiment got off to a bad start when the elephants decided it was more fun to stamp on the footballs and burst them than to chase them around the pitch. Fortunately, regular polo balls proved more successful, and elephant polo was born. The World Cup, organised by Tiger Tops, is held every year at a grass airstrip on the edge of Nepal's Chitwan national park, 90 kilometres (56 miles) southwest of Kathmandu. From the sidelines, international playboys almost choked on their gin and tonics. British aristocrats looked up from their Rolexes, cocking eyebrows with bemusement. For a moment at the King's Cup Elephant Polo Championship -- one of the circuit's Big Three -- it seemed the upstart Yanks from the Washington area might finally charge onto the scoreboard. Then something really did stir from deep inside Thong Kao. She let rip a hail of dung that left the pursuing Italians dodging for cover. And just as Zenz yanked back her mallet, Thong Kao accidentally stepped on the polo ball, squashing it into the ground and suspending play. It marked the first of many lessons for a team of rookie Americans who came to the emerald hills of the Golden Triangle this week for a crash course in one of the world's most surreal sports. During one game in Sri Lanka one 2000-kilograms mount went berserk in mid-match and threw off his rider and charged off the field and attacked the Spanish team’s minibus. The vehicle was badly damaged. Fortunately nobody was in it.